Add 1/4 cup (small load) or 1/2 cup (medium or larger) of the OdorKlenz Laundry Additive along with your regular detergent to eliminate odors from your laundry. 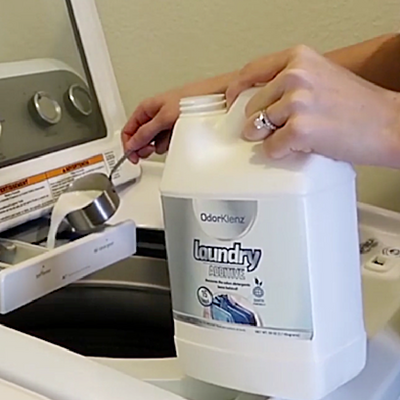 For HE and front load washers, add the additive along with your detergent in the designated detergent slot. For top load washers, first partially fill the tub with water. Next add your normal detergent, followed by the OdorKlenz Laundry Enhancer, and then the clothing last as the water continues to fill. Use along with your regular detergent, for best results use with warm water and do not use in combination with bleach or vinegar. Keep bottle closed when not in use to maintain the product’s effectiveness. 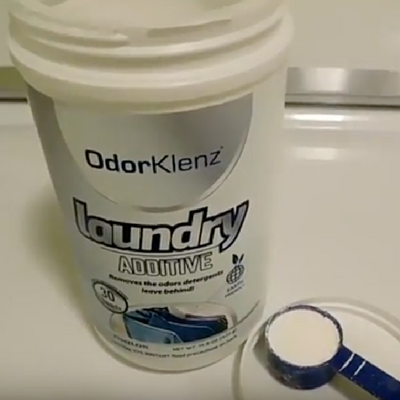 Add 1 scoop (small load) or 2 scoops (medium or larger) of the OdorKlenz Laundry Additive along with your regular detergent to eliminate odors from your laundry. For HE and front load washers, add the additive along with your detergent in the designated detergent slot. For top load washers, first partially fill the tub with water. Next add your normal detergent, followed by the OdorKlenz Laundry Powder Additive, agitate the OdorKlenz powder additive in a tub with water until the powder is completely dissolved. Once dissolved you can now add clothing. Safe for use on cotton, personal delicate, nylon, polyester, spandex, washable lace, washable rayon, washable wool, and all other washable fabrics. Not intended for use with bleach or on dry-clean-only fabrics, leather, satin, silk, and suede. This product is safe for the environment, made from proprietary materials. Safe to use in High-Efficiency washing machines.